By late Saturday afternoon, the 60 rising high school seniors who spent the week at Wabash participating in the 2007 Opportunities to Learn About Business program had completed about a semester's worth of college business, marketing, speech, and advertising classes. All in just seven days. 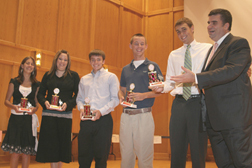 They graduated from the program in a ceremony at Wabash's Salter Hall, during which individual students and teams were recognized for their outstanding performance during the program. Click here to see pictures of this year's award winners. The program is a business simulation game that pits 12 teams of five students each in competition with each other in the ultra competitive technology market. Each team had to develop a hand-held device with a specific target market in mind, then create innovative features that their market segments would not only want to have, but couldn't live without. Devices ranged from a hand-held musical recording and amplification device to a product that would simplify the work of police and security professionals. The winning team (pictured right), which managed to keep solid financial books through the week, negotiate a labor agreement, and develop strategic marketing and advertising campaigns, was team 11, Law Tech. Winning team members were Kendall Frazier, Robert Whitsett, Zak Estes, Emily Garmire, and Angela Steinhubel. The "Labbies" who gave the top marketing presentations were Angela Steinhubel and Dan Hornsby. Team six, NTone, developed the most creative and compelling advertising campaign. Members of that team included Ross Rucker, Toby Segwick, Dan Horsnby, Stephanie Bristow, and Kimberly Shreves. The best introductory speech was given by Stephanie Bristow, while Rachel Braun gave the OLAB Commencement speech. Dan Frascella was honored with the coveted Bull Thrower Award for presenting the best Stockholder Speech. The final awards were presented to Zak Estes and Rajpreet Heir, who were named Mr. and Ms. Labbie, respectively, for performing at a consistently high level throughout the week-long program. The OLAB program is directed by Professor Bert Barreto of the Wabash College Economics Department, while Greg Shaheen, a senior vice president with the NCAA, is the Game Master.